A former colonial prison and police station in Hong Kong welcomed the public into sunny courtyards and art spaces on Tuesday as the city tries to undo its reputation for prioritising development over heritage. The multi-million renovation project saw the overhaul of the complex built by the British between the mid-19th and 20th centuries which housed the city's first jail -- Victoria Prison -- as well as its central police station and court buildings. Colloquially known as Tai Kwun, or "big station", former Vietnamese revolutionary leader Ho Chi Minh was among those jailed there in the 1930s. 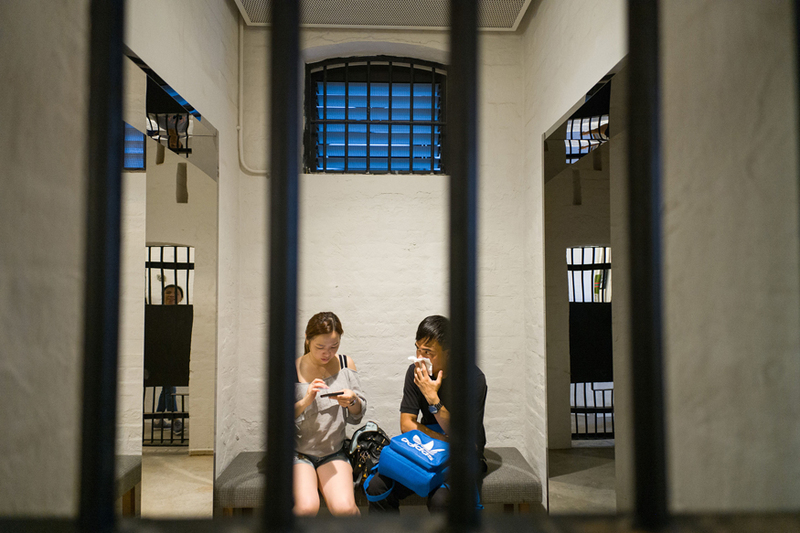 Opening its doors to the public for the first time since the renovation, visitors roamed through former prison cells which have been preserved and converted into an interactive museum. Other parts of the 16-building complex have been transformed into outdoor squares, restaurants and sleek new exhibition spaces by Swiss architecture firm Herzog & de Meuron, which designed London's Tate Modern art gallery. "There are modern buildings surrounding this but conserved elements in here. It's like the past and present are assembled together," said Annie Leung, a homemaker in her early 40s. "I live nearby, so I really wanted a leisurely and tranquil place like this," she added. High school student Smith Yip thought the museums could "really show the old days of Hong Kong" at a time when there is less space in the city for learning about local culture and history, compared with the city's ubiquitous shopping malls. One of Hong Kong's oldest surviving collection of buildings and declared monuments, the compound was officially decommissioned in 2006. It sits on a slope in the buzzing downtown Soho district, now surrounded by the densely packed city's tower blocks and skyscrapers. The revitalisation process took over a decade, complicated by the collapse of a wall and the discovery of a secret mural in a chapel. The Hong Kong Jockey Club led the project in partnership with the government, pumping in HK$3.8 billion ($484 million) and describing it as the club's largest heritage project in the city. It comes as concern grows that China wants to erase Hong Kong's colonial heritage -- some Beijing officials have called for the city to shake off its colonial past. But there has been public resistance to the airbrushing of history. Protesters chained themselves to the Queen's Pier -- the former landing place for British dignitaries -- in an unsuccessful attempt to stop its demolition in 2007. Conservationists have also campaigned against commercial and luxury redevelopment plans led by developers targeting characterful old areas of the city. Some buildings have survived -- the 106-year-old domed former legislative council building reopened as the Court of Final Appeal in 2015. Police barracks in central Hong Kong have also been converted into a shopping hub featuring local designers.